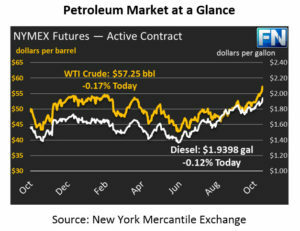 Markets rose yet again yesterday, with crude oil surpassing $57 per barrel to close the day at $57.35, a gain of 2.5%. The oil complex is reeling from a slew of geopolitical risk factors impacting producers around the world. Crude prices are calm this morning, though we said the same yesterday before prices skyrocketed in the afternoon, so who knows what may happen. 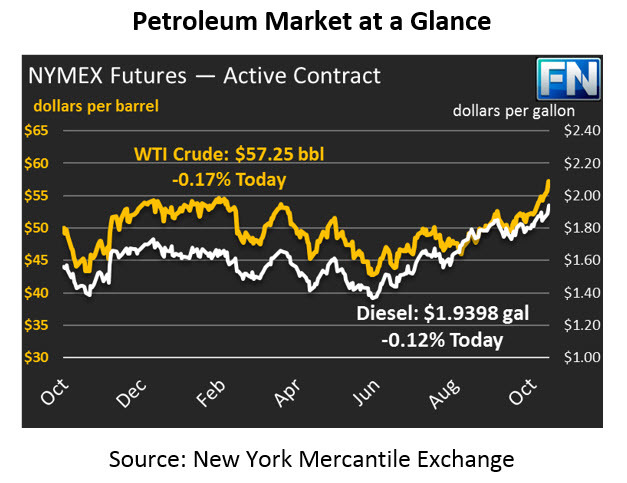 Crude markets have traded right in line with their closing price yesterday, and currently stand at $57.25. Refined products continue tracking crude higher, though with mixed results. Diesel prices gained nearly 6 cents (3.1%) yesterday, the largest price gain since Sept 1, 2017 during Hurricane Harvey. This morning diesel prices are trading roughly flat at $1.9398, though movements in crude prices could send diesel soaring or spiraling later today. Gasoline prices gained just four cents yesterday, a “small” 2.2% rise, ending the day at $1.8300. Gasoline has seen prices dip a bit lower this morning, shedding .8 cents to trade at $1.8212. Markets have been rankled by ongoing instability in the Middle East. Yesterday, Hezbollah, a militant group backed by Iran, fired a missile at the Saudi Arabian capital. Although the missile was shot down by Saudi defense, Saudi officials are calling the launch an act of war. Relations between Iran and Saudi Arabia have always been tight, with the two competing for regional authority. Escalating conflicts between the two would put a significant amount of oil production at risk, and markets are being extremely cautious. In addition to the military tensions, the on-going anti-corruption crackdown has consolidated power under the Crown Prince, adding yet another unknown risk factor. In addition to Middle Eastern instability, production globally is experiencing disruptions or threats of disruption. In Nigeria, conflict has resumed between the Niger Delta Avengers and the Nigerian government, which threatens 800 thousand barrels per day (kbpd). Venezuela has announced intentions to restructure their debt, which many worry could result in defaulting on debt. Risk of default has oil investors nervous; a default could result in asset seizures, impacting between 300 and 600 kbpd of production. In Libya, a security break at the El Sharara oil field on Sunday night caused concerns over the field’s 280 kbpd of production.